Gary Ernest Smith, Coffee Break, Oil on Canvas, 40" x 30"
Gary Ernest Smith doesn't have a problem finding subjects to paint but rather deciding on which to do now or later. He revisits three major themes. Smith's latest body of work includes some small studies as well as sizes ranging from 11 by 14 inches up to 48 by 72 inches. This prolific Utah artist continually finds his work evolving. For instance, during his creative process, he may discover a new technique or light source. "I see elements of growth in this new body of work. "I've introduced myself into a series of paintings," says Smith. "Change is important in an artist's work. And, change comes from discovery." Gary Ernest Smith, Man in Red Black and White, Oil on Canvas, 14" x 11"
Returning to a trio of past themes, Smith's new paintings include some figurative works, a series of barn images that illustrate architecture against a natural environment, and a series of landscapes generally done plein air as well as studio works derivative of his travels. There will be scenes from Oregon, where he grew up, as well as Utah, Idaho and parts of Arizona. In many of his latest pieces Smith plays up the geometrics of manmade objects against nature, especially barns. Inspired by these powerful symbols of rural American life, Smith decided long ago to chronicle the disappearing rural landscapes. "I like the barns and historic barns are disappearing quickly," he explains. "Where I live there's rural countryside but to me they're icons of a period. I like to take those barns and make them more contemporary in their design and concept and the way I put them on canvas." 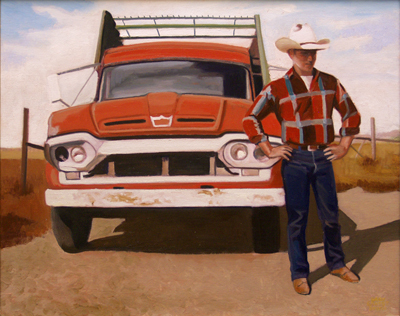 Gary Ernest Smith, Pioneer Home, Oil on Canvas, 16" x 20"
Some of Smith's new paintings combine all three themes, such as Red Truck, Red Barn. 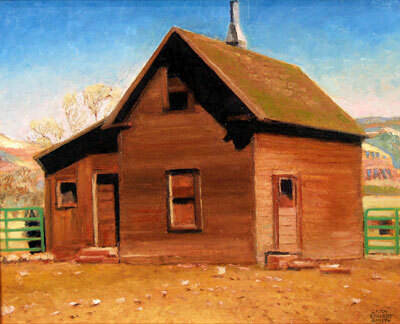 This plein air piece started in the field where Smith was attracted to the juxtaposition of the barn and the truck. He later added two small figures and pushed the colors to make it an even stronger image. Another visually strong piece is titled Barn Icon. As is often the case, the scene is based on a real barn near Smith's home, but he rearranges the objects and manipulates them a bit on the canvas. "This is one of those that was effortless. It's straightforward with strong dark and light values. It's a striking piece," says Smith. "The hardest paintings to do are those that have subtleties in value and color changes. The ones with the most contrast catch the eye." 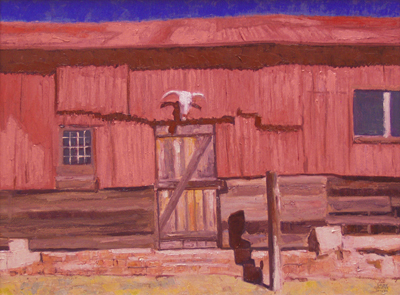 Gary Ernest Smith, Red Tin Barn, Oil on Canvas, 18" x 24"
Another piece that exhibits strong values while emphasizing a solitary figure is Man of the West. 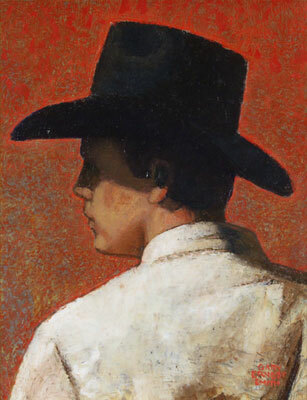 One of Smith's larger pieces at 4 by 5 feet, the painting shows a frontal view of a cowboy. The painting A Line of Vision explores the newest theme in Smith's work: a figure relating to a landscape. It's also a self-portrait of the artist in an Iowa field. Characteristic of his large landscape paintings, Smith uses a high horizon line to emphasize the land itself. "I like the broad simplicity and color range of the field. I like the patterns and divisions," comments Smith. "There's a personalization that comes from putting yourself into it." Vermillion Field represents the most contemporary in its approach with a large bright color field. Inspired by a soybean field in August, this piece illustrates Smith's passion for doing large field paintings. He intentionally makes the field prominent while suggesting something else is happening at that moment in time when you look at the margins of the painting. 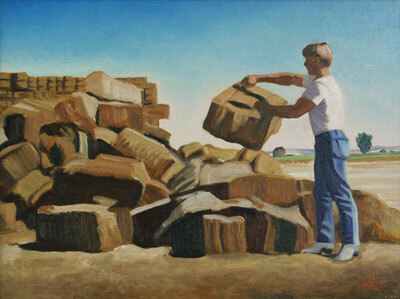 Gary Ernest Smith, Sorting Old Bales, Oil on Canvas, 18" x 24"
"I love the vast color field in that. I composed it so the field has the major emphasis with the road on the right giving it a contemporary feel. Everything else is an adjunct to the big field," explains Smith. "My field paintings are abstracted images of color and design - seemingly simple and contemporary, but representative of the impact of the hand of man on the rural landscape." Gary Ernest Smith, Through the Gate, Oil on Canvas, 24" x 30"
Inspired by something unusual, as well as mood, location and lighting, Smith's work is coming full circle. 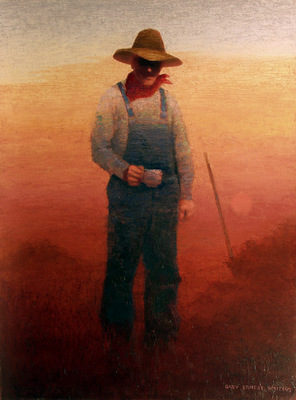 Having grown up on a farm in Oregon, he began painting images of rural America. From 1980 to 1990 he documented historical rural America by making iconic images out of it. In 1990 his work evolved into large landscapes while the figures diminished. Now he's blending the traditional and contemporary. However, two elements will continue to resonate with Smith's collectors: quality and interpretation. "I'm harkening back a bit and pulling together the traditional and contemporary. It's contemporary in how it's presented in brighter color, but I see it as a tradition in both periods. I like to abstract and simplify things even though they have a strong sense of reality. I enjoy pushing the colors and taking them beyond reality," says Smith. "I try to find the essence and simplicity in things that in general are passed over as beautiful." 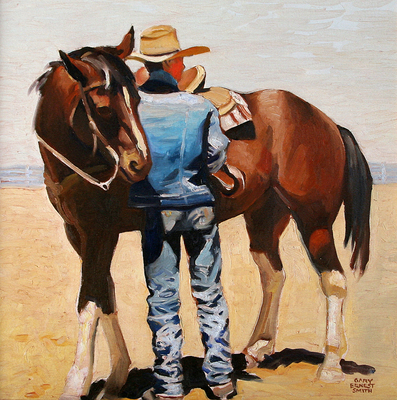 Gary Ernest Smith, Tightening the Cinch, Oil on Canvas, 16" x 16"